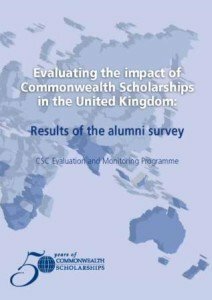 This report provides a relatively brief overview of the findings of a survey in which we asked alumni about their awards, employment and the extent to which they have been involved with projects, policymaking and wider socio-economic impact in a number of key areas. Even at this early stage, it is apparent that these awards have made aconsiderable impact on a number of levels and offer many benefits to a variety of stakeholders. Published for the CSC Welcome Programme in November 2008.